Now, I love Atlantic City for all the wonderful Jersey-ness as I mentioned in an earlier post. 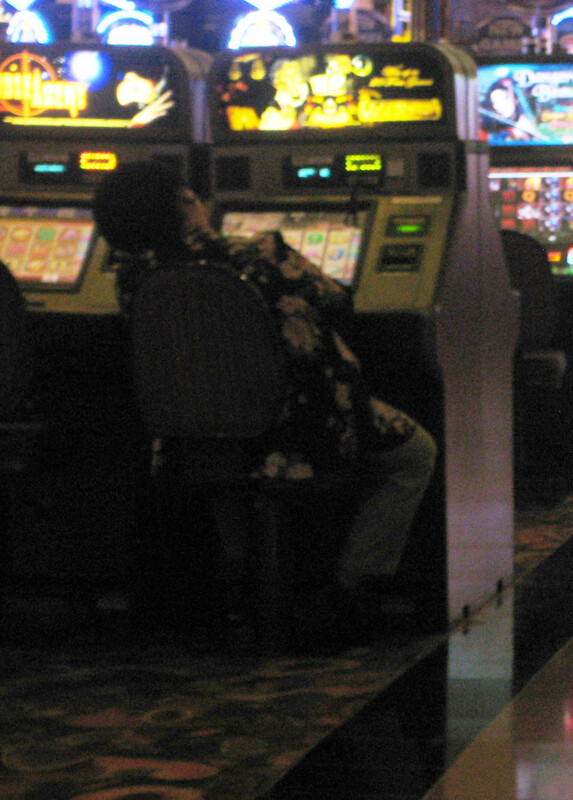 (The boardwalk sights did not disappoint this time around–and the sleepy slot-playing eldery woman made my day! Honestly, it is train-wreck central down there…) BUT…Atlantic City is hardly the East Coast Las Vegas. Nothing compares to the shopping, eating, entertainment and perfect weather of Vegas–I will take a dry 120-degree heat over the Northeast humidity (or hurricane) any day… Even though we know that Vegas has a glamorous element that AC just doesn’t–Atlantic City has the beach, pollution and obesity aside, the view of waves crashing into the sandy shore is pretty fantastic. What’s NOT so fantastic is seeing the name TRUMP on multiple buildings on a small ocean-front stretch…UGH. I go out of my way to avoid anything Trump. The Beach: If you’re driving to the beach you can load chairs, towels and other beach essentials in your car… Renting chairs if you’re not staying at one of the beach-front hotels can be costly ($8 for umbrellas and chairs , $15 for a comfy chaise lounge chair.) Caesars is the most centrally located for shopping but the Tropicana has Cabanas (reserve them SUPER early in the morning, as it is first come-first serve.) My ONE suggestion is that the Borgata have a presence on the beach! I’m sure the beach-front hotels have this coveted real estate on lockdown but it would be nice to have a sandy Borgata outpost with drinks, food, cabanas and chairs for guests…or at least a free jitney from the hotel to the beach, since they don’t have an outdoor pool! The Shopping: This is kind of a big SNORE. The Tanger Outlets have all the typical outlet stores, J.Crew, Coach, etc… And they are a serious waste of time. J.Crew doesn’t have any real deals so you might as well shop the sale section at the full-price stores. Coach is overflowing with their hideous c-logo collection and that’s pretty much it. The other stores I popped into, BCBG, St. John…were overstocked with last season’s styles. I’m not sure why these stores aren’t having blow-out sales to move merchandise but…let them sit on it. The Pier Shops at Caesars were a disappointment, too–I guess coming from NYC it was just more of the same, True Religion, Scoop, Juicy Couture (yuck), Levi’s…they also have some luxury brands such as Gucci, Louis Vuitton, Burberry and Salvatore Ferragamo that are probably not making enough in revenue to pay their electric bills…it was a ghost-town on that portion of the pier. MUST HAVE: Saltwater Taffy! This treat will find every cavity and yank out recent fillings but it is delicious. Until about piece number twelve–then you’ll be sick. You can find it anywhere along the boardwalk. The Hotels: Unless you’re a super high-roller and you can get suites all around town, there are really only two places in Atlantic City to book a room: Borgata or The Water Club at Borgata. Borgata has comfortable high-end rooms and good food options (Bobby Flay Steak, SeaBlue, Wolfgang Puck American Grille, Izakaya and Fornelletto) and night clubs (MIXX and mur.mur–yes there is a period between the murs. Am I supposed to read it as mur-pause-mur?) The Water Club has better rooms with 400-thread count egyptian cotton sheets, flat TVs, and an outdoor pool. Apparently, an outdoor pool is hard to come-by in AC–I know the Northeast only sees three months of warm weather AND the beach is a few miles away–but I love lounging by the pool, cold drinks, lunch menu–and no sand in my sandwich. The Tropicana has the family-style Italian, Carmine’s or PF Changs (I know this is a cheesy chain but I kind of like it…maybe it’s the salt content or the neatly organized dipping sauces.) They also have Red Square. Just in case the name didn’t tip you off, it’s a Russian themed Vodka and Caviar bar. There is also Buddakan at The Pier shops at Caesars and a surprisingly nice brunch at Trump Plaza’s Evo on the boardwalk. The staff at Evo was friendly and sweet and I would return just for the service…my only complaint is…I wish the restaurant was elevated a bit more to avoid the boardwalk bustle and take in the ocean view. Maybe have the outdoor seating up on a platform? This entry was posted in TRAVEL and tagged atlantic city, atlantic city new jersey, bcbg, beach vacation, borgata, buddakan atlantic city, caesars atlantic city, coach, j. crew, las vegas, pf changs, tanger outlets, the piers at caesars, the water club, the water club at borgata, travelogue, trump. Bookmark the permalink.